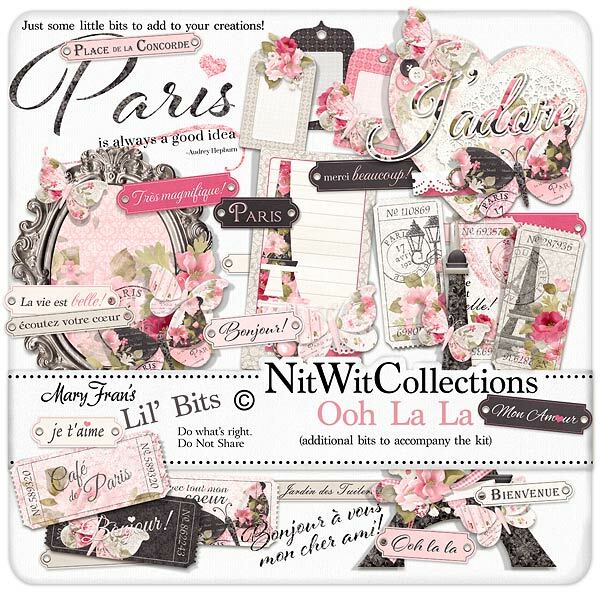 Lil' Bits "Ooh La La" will get you exclaiming over the graceful and lavish images contained in this extra digital elements pack! There are so many exquisite embellishments for you to choose from....the clustered frames, the butterfly heart or the tickets....choices, choices and more choices. This is a do not miss pack!! Don't miss out on these digital elements as they are not included in the FQB "Ooh La La" Collection so don't pass these by! 1 Butterfly heart that is laden with beautiful elements....the perfect central image for your cards, layouts and crafting projects! 1 Eiffel Tower with added flowers and butterflies...it deserves this sort of embellishment! 1 Sentiment - "Bonjour a Vous..."
1 Sentiment - "Paris is Always a Good Idea"
3 Tickets in vertical form that look as if they were precious memories saved from years ago. Which one will you choose to use? !